CognitiveTPG is expanding its line of mobile printing options with the entrance of its industry proven POS Receipt printers and Barcode Label printers enabled with Bluetooth connectivity. Integrating the Bluetooth technology into the A799II POS and DLXi Label printers allows customers to connect to a Bluetooth enabled host such as a tablet, smart phone or mobile computer. The A799II and DLXi Bluetooth enabled printers pair with Windows and Android platforms, and iOS coming soon. 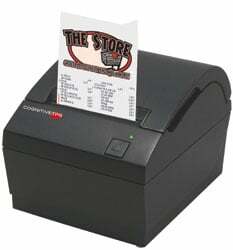 CognitiveTPG has announced an addition to its line of POS Receipt Printers, the A799II. The A799II, which is being demonstrated at the National Retail Federation Big Show this week in New York City, will be available to the general market in Q2 2014. The A799II achieves the best performance, reliability and price for a receipt printer, reaching a 350 mm/sec (13.79 inches per second) print speed. Like the other CognitiveTPG receipt printers the A799II includes some of the industry’s highest reliability standards with its unique ceramic knife delivering a life of 3 million cuts, a printhead life of 242 km (150 miles), 72 million printlines, and a 4-year warranty.